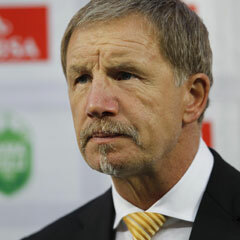 Johannesburg - Stuart Baxter was left with mixed emotions after Kaizer Chiefs failed to find a way past Mamelodi Sundowns following their 0-0 draw at Loftus Stadium on Tuesday. According to the Football411.com website, Chiefs dominated for long spells but were wasteful in the final third and, although they did up their work rate in the second period, they failed to truly test Wayne Sandilands in the Downs goal. The result means PSL leaders Amakhosi are now just two points ahead of Orlando Pirates, who play SuperSport United on Wednesday, giving the defending champions the chance to reclaim the summit. "I thought we were quite good in the first half, although there was some poor decision making and we didn't play like we normally do, but in the second half thought we played more like the Kaizer Chiefs I like to know," Baxter said after the game. The Englishman welcomed back no fewer than seven players from Bafana Bafana's Africa Cup of Nations campaign on Friday, with all of them starting this week's clash, and Baxter was pleased with how they readjusted to the domestic stage. "I was expecting them to maybe take some time to get into it following AFCON, but we put together some quick passing moves and that's what we need to do," he said. The PSL's fixture list goes into overdrive over the next few weeks, but the Chiefs boss said he is not looking too far ahead on the calendar. He added: "We just have to take it one game at a time. We have to think about our actions, think about what we're doing, and we didn't do that today. "That allowed Sundowns to get in other game, and that put us down a but, but I'm pleased with the players' performances today(Tuesday) and we'll go from here."